The Institute has been working with the Central Land Council to evaluate its community development program. In 2005, the Central Land Council (CLC) established the Community Development Unit (CDU) to implement a community development program that works with rent and royalty monies from mining. The program seeks to both maintain Aboriginal identity, language, culture and connection to country and strengthen Aboriginal capacity to participate in mainstream Australia through improving health, education and employment outcomes. The program is one of the largest self-funded and demand driven service and development programs of its kind in the Northern Territory. In 2011, the CLC established the Lajamanu Governance Project in partnership with Lajamanu residents. This three-year project uses a development approach to strengthen effective and legitimate decision-making and implementation processes, and address the ‘governance gap’ in remote communities, starting in Lajamanu. In 2013, an independent, government-funded evaluation was commissioned to assist the CLC to ‘explore and improve its development work in order to maximise the benefits for Aboriginal people’. 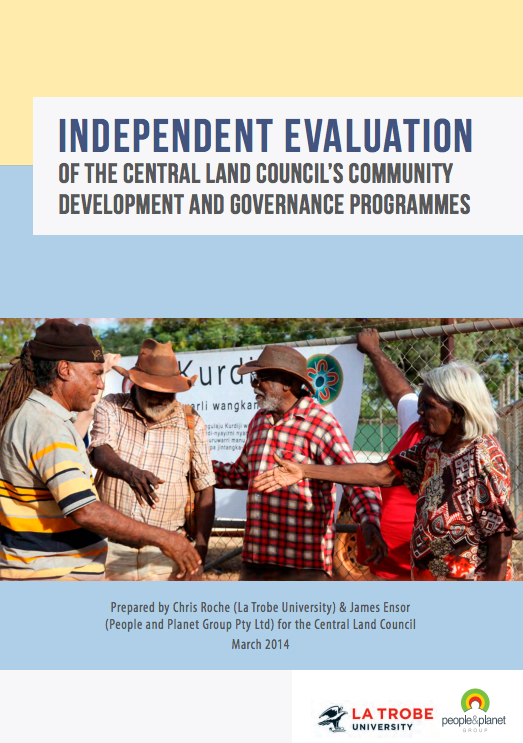 The final report, Independent Evaluation of the Central Land Council’s Community Development and Governance Programs, was published in March 2014. The infographic below provides a visual summary of the findings of the evaluation. For the period 2005-2013, $25.2M of Aboriginal funds was used for community benefit, growing from about $0.5M p.a. in the first two years, to $5M p.a. in the last four years. This indicates an important and growing commitment from Aboriginal people choosing to spend their money in a collective manner. The CDU has largely delivered on its goal, in a cost-effective manner, of making a tangible difference to Aboriginal people’s lives. The outcomes achieved align with the five priority areas identified in the Australian Government’s recently announced Indigenous Advancement Strategy. Importantly, the efficacy of the CLC’s Community Development Framework and processes employed in delivering the programs, based on Aboriginal control, ownership, empowerment and self-identified priorities are supported by the evidence. Moreover, the CDU’s approach in supporting and facilitating communities to determine and prioritise – with legitimacy – their development outcomes is to be recognised. CLC’s processes challenge and update definitions of community development outcomes and how they are best achieved. Whilst both Aboriginal people and service providers valued outcomes related to health, education and employment, Aboriginal people were more likely to express the view that strengthening culture and enhancing their voice and control, are in and of themselves an intrinsic part of the development process, and are central to achieving development outcomes. Strong community governance is thus crucial for communities to be able to engage and negotiate with governments, drive their own development objectives, and hold service providers and agencies to account for performance and delivery of projects to meet those objectives. The CLC’s successful elaboration of highly tailored and context specific approaches in practice were essential to the effectiveness of its development work in each community. This resonates with international development practice, where there is a move away from inappropriate importation of often alien ‘best practice’ to supporting processes which are a ‘good fit’ with the local context and ‘go with the grain’ of indigenous political and cultural realities. requisite high level of cross-cultural skills and ways of working. how collective action between numerous actors is critical in determining community well-being. Given the new Indigenous Advancement Strategy and Remote Community Advancement Network, and a revised Stronger Futures in the Northern Territory policy, there is opportunity to amplify and leverage the work of the CDU to enhance the outcomes envisaged for the “place-based initiatives”, “tailored local solutions”, and programs “that work with communities to produce long-term transformational change”. It is worthwhile noting that the CLC’s Community Development Program goals are consistent with the five priority areas of the Indigenous Advancement Strategy: jobs, land and economy; children and schooling; safety and wellbeing; culture and capability; and remote Australia strategies. Leveraging the CDU’s program requires concerted efforts to create opportunities for other communities and organisations in remote Indigenous communities to deliberate how the CLC’s experience can be applied to their particular context. Government agencies can support these deliberations amongst organisations to establish a shared understanding of Indigenous development and concomitant practices required in their work in remote Indigenous communities. 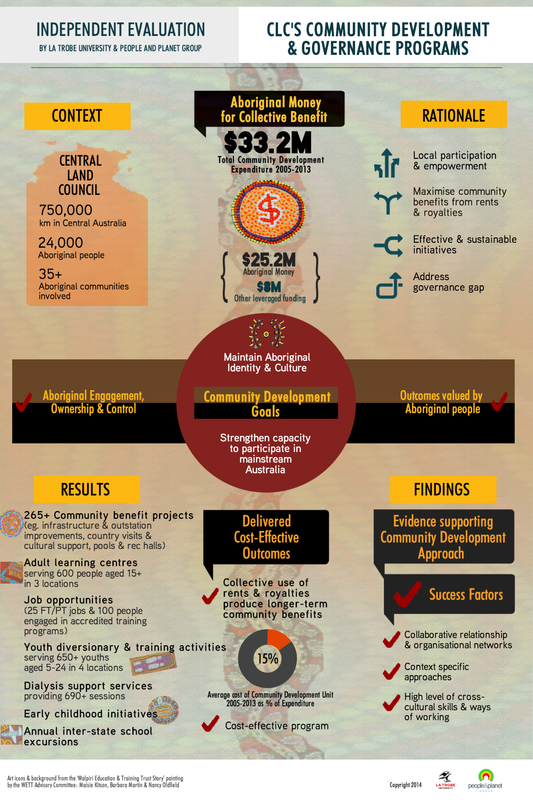 This article draws on the “Policy Brief – Independent Evaluation of the Central Land Council’s Community Development and Governance Programs, May 2014”, by Associate Professor Chris Roche and Thu-Trang Tran from the Institute, available at the Central Land Council’s website here.